St. Joseph Parish is a welcoming Catholic community of faith that embraces its diversity and reaches out to all of God’s children. We nourish our faith in our Lord Jesus Christ through the Sacraments, the Word and the Eucharist. We strive to increase out stewardship by sharing our time, talent and treasures. St. Joseph Parish is steeped in local history. It all started in 1916 when George Zamits donated land he purchased from Stuart’s first settler, Hubert Bessey. A group of local Catholic men, armed with hammers, saws and a plan, sought to bring the first Catholic church to Stuart, a city of dirt roads, a booming business district and about 700 people. Their dream was realized when, on March 19, the feast of St. Joseph, the first Mass was celebrated with 35 people in attendance. This first church served Stuart-area Catholics for 31 years. By 1947, St. Joseph needed a new church. But without much money, what were they going to do? A parishioner named Ben Hodapp came up with the idea to purchase the old chapel at Camp Murphy (now Jonathan Dickinson State Park) in Hobe Sound. Once a busy house of worship in a training camp for the US Army Signal Corps during World War II, the chapel hadn’t been used since the war ended in 1945. Next came the question of how to get the chapel to Stuart. It was so heavy it had to be sawed in half so a contractor could haul it over land to the water. It was hoisted onto a barge and floated north on the Indian and St. Lucie rivers—a trip that took a day or two—and was then hauled ashore where it was re-assembled at its new location on what is now East Ocean Boulevard. The first Mass in the new church was celebrated on Thanksgiving Day in 1947. After fire burned St. Joseph’s second church in early 1960, a new building was erected on the site of what is now the Family Center and was dedicated by Miami Bishop Coleman F. Carroll on July 23, 1961. The Sisters of St. Joseph of St. Augustine originally established St. Joseph School in 1961. Currently, the Sisters of the most Holy Soul of Christ from Poland work and minister in our church and school. Finally, the current Church, which holds approximately 1,100 people, was dedicated on December 12, 1981, by Archbishop Edward McCarthy. 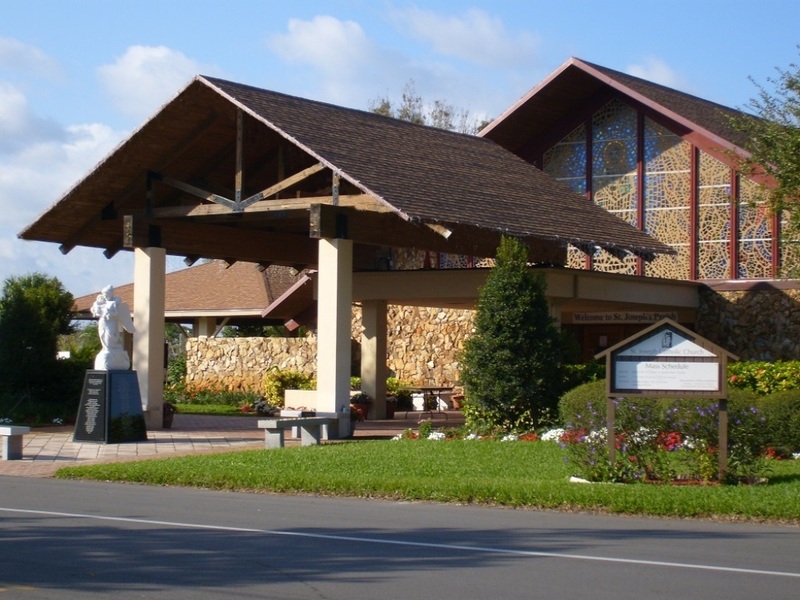 New parishes, carved from the boundaries of St. Joseph and established with help from this church, include: St. Christopher in Hobe Sound in 1952; St. Jude in Tequesta in 1962; St. Lucie in Port St. Lucie in 1965; Holy Cross in Indiantown in 1967; St. Martin de Porres in Jensen Beach in 1973; Holy Redeemer in Palm City in 1983; and St. Andrew in Stuart in 1999.